Petroleum geology is the study of origin, occurrence, movement, accumulation, and exploration of hydrocarbon fuels. It refers to the specific set of geological disciplines that are applied to the search for hydrocarbons. A range, in geography, is a chain of hills or mountains, or a somewhat linear, complex mountainous or hilly area. The South Slavic languages are one of three branches of the Slavic languages. There are approximately 30 million speakers, mainly in the Balkans. These are separated geographically from speakers of the other two Slavic branches by a belt of German, Hungarian and Romanian speakers. The first South Slavic language to be written was the variety spoken in Thessaloniki, now called Old Church Slavonic, in the ninth century. It is retained as a liturgical language in some South Slavic Orthodox churches in the form of various local Church Slavonic traditions. The Italo-Dalmatian languages, or Central Romance languages, are a group of Romance languages spoken in Italy, Corsica (France) and formerly in Dalmatia (Croatia). Johann Weikhard Freiherr von Valvasor or Johann Weichard Freiherr von Valvasor or simply Valvasor was a natural historian and polymath from Carniola, present-day Slovenia, and a fellow of the Royal Society in London. Ha Long Bay is a UNESCO World Heritage Site and popular travel destination in Quang Ninh Province, Vietnam. The name Hạ Long means "descending dragon". Administratively, the bay belongs to Ha Long City, Cam Pha City, and is a part of Van Don District. The bay features thousands of limestone karsts and isles in various shapes and sizes. Ha Long Bay is a center of a larger zone which includes Bai Tu Long Bay to the northeast, and Cat Ba Island to the southwest. 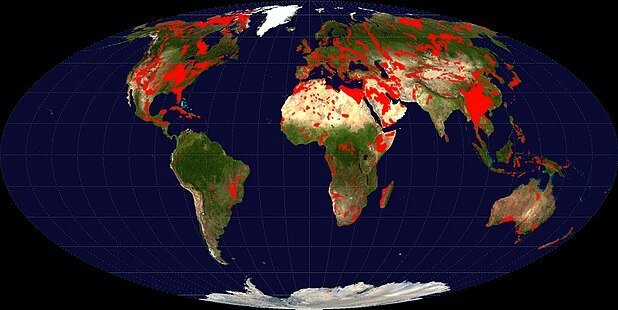 These larger zones share a similar geological, geographical, geomorphological, climate, and cultural characters. A foiba — jama in South Slavic languages scientific and colloquial vocabulary — is a type of deep natural sinkhole, doline, or sink, and is a collapsed portion of bedrock above a void. 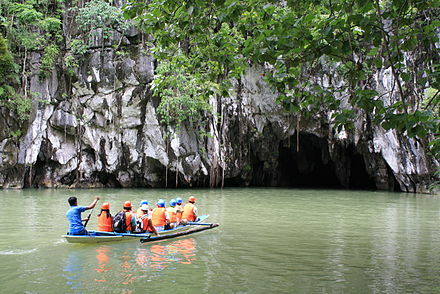 Sinks may be a sheer vertical opening into a cave, or a shallow depression of many hectares. They are common in the Kras (Carso) region shared by Italy and Slovenia, as well as in a karst of Dinaric Alps in Bosnia and Herzegovina, Montenegro and Croatia. The Altopiano delle Murge is a karst topographic plateau of rectangular shape in southern Italy. Most of it lies within Apulia and corresponds with the sub-region known as Murgia or Le Murge. The plateau lies mainly in the Metropolitan City of Bari and the province of Barletta-Andria-Trani, but extends into the provinces of Brindisi and Taranto to the south; and into Matera in Basilicata to the west. The name is believed to originate from the Latin murex, meaning "sharp stone". 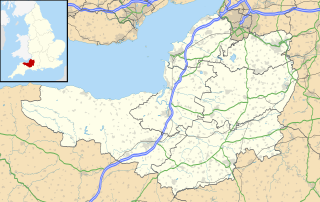 Sidcot Swallet is a cave near Burrington Combe, in the Carboniferous Limestone of the Mendip Hills, in Somerset, England. The Eramosa Karst is a provincially significant Earth Science Area of Natural and Scientific Interest in Ontario, Canada, located in Stoney Creek, a constituent community of the City of Hamilton, and immediately south of the Niagara Escarpment. Karst fenster is a geomorphic feature formed from the dissolution of carbonate bedrock. In this feature, a spring emerges, then the discharge abruptly disappears into a sinkhole. The word fenster is German for 'window', as these features are windows into the karst landscape. A ponor is a natural opening where surface water enters into underground passages; they may be found in karst landscapes where the geology and the geomorphology is typically dominated by porous limestone rock. The Nambung River is a river in the Wheatbelt region of Western Australia, 170 kilometres (106 mi) north of Perth. The river drains an area between the towns of Cervantes and Badgingarra. In its lower reaches the Nambung River forms a chain of waterholes in the Nambung Wetlands where it disappears underground into a limestone karst system 5.5 kilometres (3 mi) from the Indian Ocean. A solutional cave or karst cave is a cave usually formed in the soluble rock limestone. It is the most frequently occurring type of cave. It can also form in other rocks, including chalk, dolomite, marble, salt beds, and gypsum. 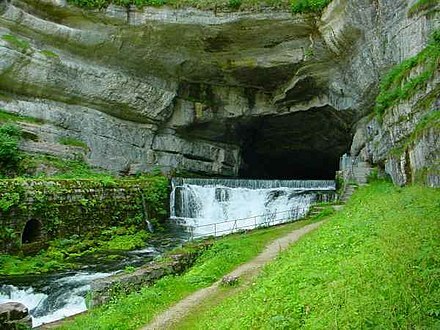 Škocjan Caves Regional Park is located in the Škocjan Karst, a vast flat landscape that lies at an elevation between 420 and 450 m in the southeast part of the Karst area. Following its independence, the Slovenia committed itself to protecting the Škocjan Caves area; for this reason, it established Škocjan Caves Regional Park and its managing authority, the Škocjan Caves Park Public Service Agency. Uvala is originally a local toponym used by people in some regions in Slovenia, Croatia, Bosnia and Herzegovina, Montenegro and Serbia. 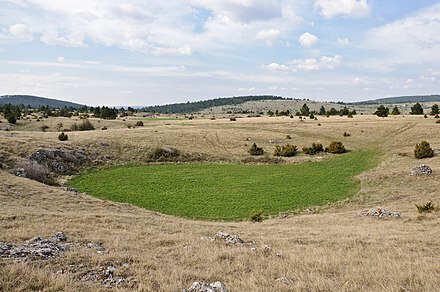 In geosciences it denotes a closed karst depression, a terrain form usually of elongated or compound structure and of larger size than that of sinkholes (dolines). It is a morphological form frequently found in the “Outer Dinarides” anywhere between Slovenia and Greece. But large closed karst depressions are found on all continents in different landscapes and therefore uvala has become a globally established term, used also to distinguish such depressions from poljes. Definitions of uvalas are often poorly empirically supported. “The coalescence of dolines” is a most frequently found and still dominant explanation. Yet because of the ongoing dissatisfaction with this definition the term ‘uvala’ has often been belittled – occasionally it was even proposed that the term be given up altogether. The Municipality of Mirna Peč is a municipality in southeast Slovenia, located in the traditional region of Lower Carniola. The seat of the municipality, which was established in 1998, is Mirna Peč. With an estimated population of 2,800, the municipality is included in the Southeast Slovenia Statistical Region. Zalomka is a karstic river in the southern part of Bosnia and Herzegovina, and one of the largest sinking rivers in the country and the world. It collect its waters from Gatačko Polje. The Karst Living Museum is a nature trail in Slovenia. 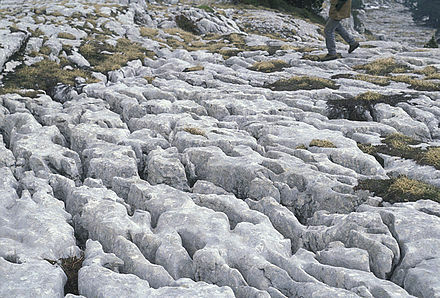 Part of the Karst Plateau, the museum is an ecologically-important area with many karst features. It was recognized as Slovenia's best thematic trail in 2017, and the region is a Natura 2000 site. 1 2 3 Ford, Derek (2007). "Jovan Cvijić and the founding of karst geomorphology". Environmental Geology. 51: 675–684. doi:10.1007/s00254-006-0379-x. ↑ Shorter Oxford English Dictionary. 2002. Vol. 1, A–M. Oxford: Oxford University Press, p. 1481. ↑ Seebold, Elmar. 1999. Kluge Etymologisches Wörterbuch der Deutschen Sprache, 23rd edition. Berlin: Walter de Gruyter, p. 429. ↑ Tomislav Šegota (25 January 2009). "Krš ili kras? Krš! - Geografija.hr". Geografija.hr (in Croatian). Retrieved 30 October 2018. ↑ Mate Matas (7 June 2004). "Veliki krš oko krša u jeziku - Geografija.hr". Geografija.hr (in Croatian). Retrieved 30 October 2018. ↑ Josip Roglić (1974). Krš Jugoslavije (Volume 9/1 ed.). Zagreb: JAZU Jugoslovenska Akademija Znanosti i Umjetnosti. p. 29. ↑ Pörtner, Rudolf. 1986. Bevor die Römer kamen: Städte und Stätten deutscher Urgeschichte. Rasatt: Pabel-Moewig Verlag, p. 88. 1 2 Snoj, Marko (2003). Slovenski etimološki slovar. Ljubljana: Modrijan. p. 318. 1 2 Bezlaj, France (ed.). 1982. Etimološki slovar slovenskega jezika, vol. 2, K–O. Ljubljana: SAZU, p. 82. ↑ Gams, I., Kras v Sloveniji — v prostoru in casu (Karst in Slovenia in space and time), 2003, ISBN 961-6500-46-5. ↑ Paul Larsen, Scientific accounts of a vanishing lake: Janez Valvasor, Lake Cerknica and the New Philosophy, 2003. ↑ Cvijić, Jovan (1918). "Hydrographie souterraine et évolution morphologique du Karst". Recueil des travaux de l'institut de géographie alpine (in French). 6 (4): 375–426. Retrieved June 5, 2017. ↑ Gilli, Éric; Mangan, Christian; Mudry, Jacques (2012). Hydrogeology: Objectives, Methods, Applications. Translated by Fandel, Choél. CRC Press. p. 7. 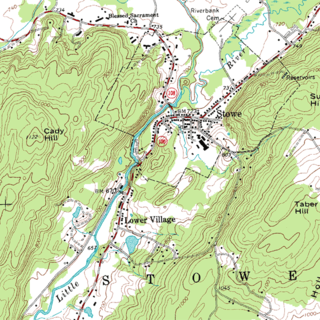 ↑ "What is Karst (and why is it important)?". Karst Waters Institute. ↑ Galdenzi, S.; Cocchioni, M.; Morichetti, L.; Amici, V.; Scuri, S. (2008). "Sulfidic ground water chemistry in the Frasassi Cave, Italy" (PDF). Journal of Cave and Karst Studies. 70 (2): 94–107. ↑ Whittow, John (1984). Dictionary of Physical Geography. London: Penguin, 1984, p 292. ISBN 0-14-051094-X. Wikisource has the text of the 1911 Encyclopædia Britannica article Karst .